Big news! Most of the tree markers on both the Glen Echo and the Indianola Tree Walks are in. 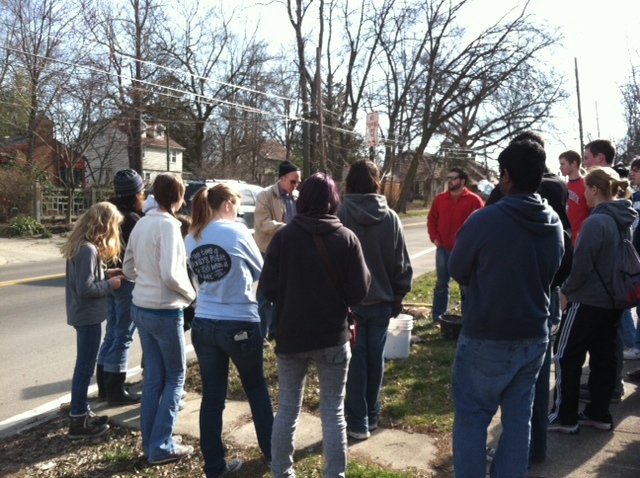 A HUGE thank you to the OSU students who, once again, showed up in force to help out (and to Laura for securing them). And a shout out to our friends from Indianola Informal K-8 who carted off the leftover soil – and more importantly, got all the markers in place yesterday afternoon. And thanks to Mike for contacting all those homeowners who have a tree on their private property so we can place their markers. Jason, our resident engineer, helped make sure the students all had proper training in how to put the markers in. I’m certain a slide rule was used. :-) Thanks so much to all for braving the less than spring-like temperatures to get all these markers in place. The markers look very nice. They list the scientific and common name as well as an image of one of the leaves from the tree. 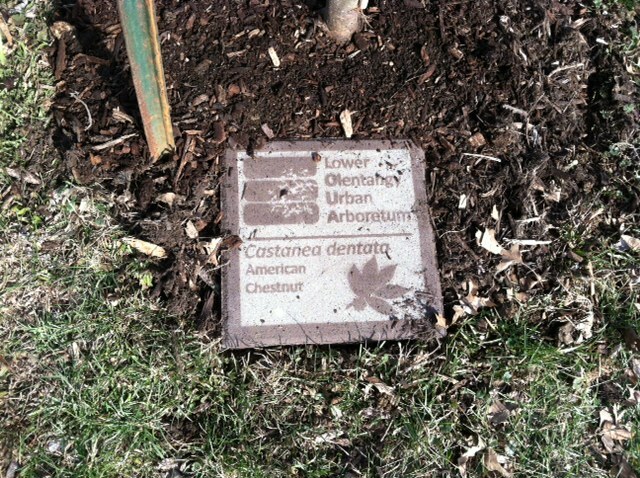 Below is the first marker put in, appropriately enough, at the first tree ever planted in the Arboretum – an American Chestnut right across from the LOUA kiosk. 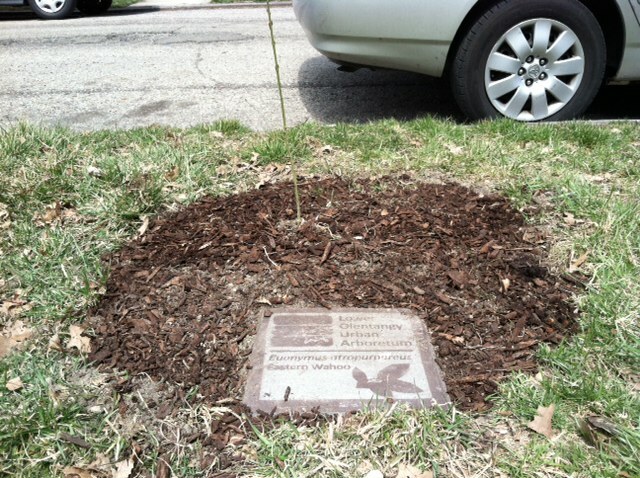 Each tree with a marker had mulch placed around it, too. This is the marker in front our our house – an Eastern Wahoo. I have to tell you that as I went for my walk today and passed by our LOUA trees with their markers in place, it surely brought a smile to my face. If you would like to see the tree markers for yourself, don’t forget our first tree walk tomorrow (Sunday) at 2pm. Meet at the LOUA kiosk on Weber. And with spring coming, we have plenty of things planned, especially in April. We have a tree planting next Saturday at 10am; if you can help out, come to the kiosk. Check out all the LOUA events here! These are beautiful tree markers. Are they concrete? May I ask where you found them? Thanks much. They are just concrete pavers that were spray painted. From a home improvement store! They’re just beautiful! I’m guessing someone did some Banksty-style stencils with paper and an exacto knife for spraypainting? Not sure I can do as lovely a job, but I guess I can try. Traditional tree labels are not cheap and we have a community orchard/food-forest starting up a few properties from me in Seattle. Thanks for the great tip! I’m not sure how they were done. I think a computer did the program for a laser to cut the stencil. It was done at Ohio State’s landscape architecture dept. You are in Seattle? Cool that you Hearn about our arboretum!